For any fire and EMS curricula and stress management programs. 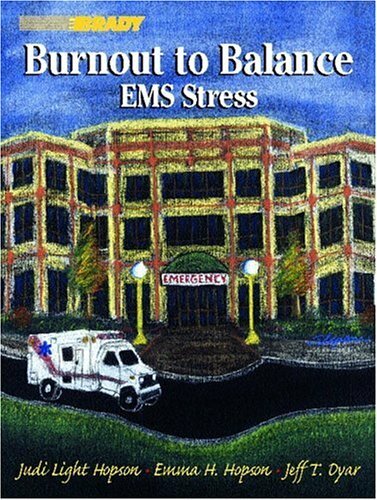 Enriched with personal case studies, this authoritative text provides EMTs and paramedics with practical advice and self-help techniques for coping with stress and achieving a healthy balance in their professional and personal lives. Addressing the pressures of work, family and patient care, it discusses ways to find more options and make wiser choices whenever a difficult situation arises, and reveals an important series of "control buttons" that can be manipulated within each major life area to prevent or reverse burnout to a large degree. JUDI LIGHT HOPSON is an author and journalist who specializes in psychology topics. For over 25 years, she has written for numerous magazines including Essence, Columbia, Home Life, Catholic Digest, Christian Single, Living with Children, Mature Living, St. Anthony Messenger, Signs of the Times, and Equal Opportunity. She was a contributing writer and columnist for the former Emergency magazine for five years. Her topics for the magazine focused on stress management and emotional well-being. Judi's feature articles have appeared in major newspapers such as the San Francisco Chronicle, the Chicago Tribune, the Christian Science Monitor, and the Miami Herald. Her work has been syndicated worldwide by the Christian Science Monitor Radio News Service, United Feature Syndicate, and Universal Press Syndicate. She presently co-authors the national newspaper column Person-to-Person with Emma H. Hopson, R.N., and Ted Hagen, Ph.D. The column, which offers advice on work and family issues, is distributed to more than 300 newspapers by Knight-Ridder/Tribune Information Services, Washington, D.C. Judi lives with her husband James near the Johnson City, Tennessee, area. EMMA H. HOPSON, R.N., is a writer who has worked in the medical field for over 20 years. She has held administrative positions, including manager of a 32-bed ICU and clinical manager of the ER, at the Johnson City Medical Center in Tennessee. Her articles have appeared in such magazines as Emergency, Columbia, and St. Anthony Messenger. She also co-authors the national newspaper column Person-to-Person with Judi Light Hopson and Ted Hagen, Ph.D., a psychologist Emma teaches seminars on career development for health care professionals and speaks regularly on self-help psychology topics. Currently, she is the director of nursing for a long-term care facility. She resides with her husband of 20 years and their daughter in upper east Tennessee. JEFF DYAR is EMS program chair at the National Fire Academy in Emmitsburg, Maryland. His lifelong career in EMS began 30 years ago as a volunteer on a small-town ambulance service. He also served as an U.S. Army Medic. Jeff is an alumnus paramedic of Swedish Medical Center, Denver, Colorado. His experience includes service in public, third service, and private ALS-EMS organizations and as a career firefighter. Jeff has held academic posts at the university level and developed and directed paramedic-level training programs. Jeff was recognized at a White House presidential ceremony for his contributions to the Reinvention of Government program. He is also a recipient of the James O. Page Lifetime Achievement Award from the International Association of Fire Chiefs for national leadership in EMS and the fire service. As an author, his writing and editing contributions include books, journals, college-level EMS management courses, and advisory positions for several media companies. Jeff is the CEO of the Far View Group (www.farviewgroup.com) and is a featured presenter and educator-facilitator at national EMS and fire service conferences. His wife and two sons support him in these interests and efforts. Hopson, Judi Light; Hopson, Emma H.; Dyar, Jeff T.
2. Burnout to Balance: EMS Stress Hopson, Judi Light; Hopson, Emma H. and Dyar, Jeff T.
3. Burnout to Balance: EMS Stress Hopson, Judi Light; Hopson, Emma H. and Dyar, Jeff T.